At Swan Mountain Snowmobiling, we believe that you should have as much information as possible to help you decide if a Montana snowmobile vacation is right for you. Listed below are several frequently asked questions regarding lodging, our guided snowmobiling, our snowmobile rentals, our location, what is provided versus what you need to bring for a Montana snowmobile vacation and more. We are constantly adding to this list so be sure to check in often or just email us with your questions. What if damages occur to the machine while on the tour? Do we tip the guide? Are there other things to do in addition to snowmobiling? What do we need to bring for our guided snowmobile tour? What is not included in your Montana snowmobile tours? 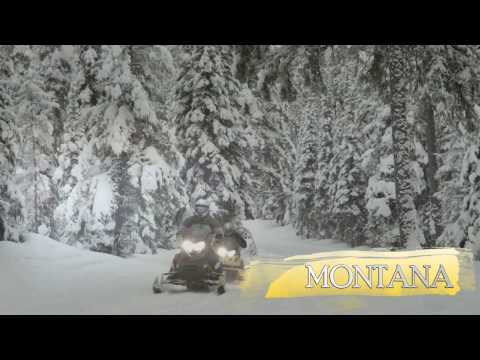 What is included in your Montana snowmobile tours? Do your Montana snowmobile tours include transportation? Do your Montana snowmobile tours include lodging? What is the minimum age to ride a snowmobile (as a passenger)? In short, the driver assumes all financial responsibility for any damages to the machine. We do not offer insurance for the machines. Damages can range from small repairs, (such as a cracked mirror) to the total cost of the snowmobile (around $11,000) and everything in between. Prior to tour departure, guests are required to sign an “Equipment Rental Contract” assuming liability for the risk of loss or damage to the equipment rented. All guests will have ample opportunity to inspect the equipment to make sure it is in proper working order before signing the contract. Please understand, we are not familiar with each guests’ personal automobile or homeowners insurance policies, however, it is unlikely that these policies will cover any accidental damages on the tour. Full payment is required at the time of booking, but you can receive a 75% refund with at least 48 hours notice of a cancellation. If you no show for your tour or cancel, with less than 48 hours notice, your trip is non-refundable. Full payment is required to make a reservation. Visa, MasterCard and Discover are accepted. A 75% refund will be given with at least 48 hours notice of cancellation. All no shows or cancellations with less than 48 hours notice are non-refundable. The most important thing for guests to remember is that guiding is a service business, and all guides throughout the world rely on their tips as part of their earnings. That said, they must earn your tip. There have been many published guidelines on the amount to tip, e.g. $50 a day per person for a guide or 10-20% of the trip cost. If you are coming with a group, it is always a good idea to talk with others about how much they plan to tip, so as to avoid embarrassment. If you are staying at one of the recommended lodging choices before or after your trip, tips there are separate. If you feel as though your guide deserves a tip you will want to give that to them directly in cash. As mentioned elsewhere in our site, Glacier Country is a true winter wonderland. Guests can enjoy a myriad of other activities during their winter vacation in Montana including, but not limited to: cross-country skiing, snow-shoeing, downhill skiing or snowboarding, dog sledding, ice skating, ice fishing, sleigh rides and a visit to Glacier National Park. Let us know what your group is interested in and we will help you come up with a plan. We offer a wide array of snow apparel for rent including: jacket and bib sets or full suits, boots and gloves. These items are available individually for $5 or three items for $10. We will provide detailed information upon booking, but essentially you’ll want to dress for playing in the snow all day. We suggest a good pair of Polypropylene style long underwear (top, bottom–and women will appreciate a good sports bra); a good pair of ski socks (polypropylene or wool, no cotton); comfortable middle layers over long underwear suits such as sweaters, sweatshirts, and sweatpants; polar fleece; waterproof and windproof outer layers (ski or snow pants and jacket); gloves. Helmets are required (and provided free of charge for all riders). Earrings can be uncomfortable under helmets, so you will want to keep that in mind. A camera is also a must-have to capture the spectacular beauty of snow dusted trees, frozen lakes and blanketed mountain sides. The cost of your snowmobile tour excludes transportation to/from the airport, lodging, lunch, gratuities and winter apparel (although you can rent this from us for a nominal fee). All of our Montana snowmobile tours include helmets and avalanche beacons for all riders, an avalanche backpack and shovel per sled and all the fun you can handle! Additionally, our sunrise and sunset tours include tasty snacks and hot drinks. Swan Mountain Snowmobiling proudly operates in more locations than any other snowmobile outfitter in the Flathead Valley. We offer guided tours and unguided rentals, under US Forest Service permit, on three unique trail systems. The first is the Desert Mountain area which lies between Hungry Horse and the Great Bear Wilderness and boasts spectacular views of Glacier National Park. The second area is Canyon Creek which originates north of Columbia Falls and crosses Werner Peak to connect with the Olney Creek and Taylor Creek trails up to Big Mountain. Finally, we are the only outfitters that operate commercially in the Crane Mountain area, which is located in the Swan Valley and known for stunning views of the Swan and Mission Mountain ranges as well as Flathead Lake. Given the short duration of trips and the variety of other winter activities available in Glacier Country, most guests fly into Kalispell and rent a car for the entirety of their stay. That said, our primary focus is to make your Montana snowmobile vacation second to none. We can provide round trip passenger pick up for a fee which depends on the distance of your location from the trailhead. On average this fee is $50 per vehicle/per way and vehicles can carry up to 6 passengers. Swan Mountain Snowmobiling does not personally provide lodging but we have very close relationships with several lodging providers who range from bed & breakfasts, cabins, condos, lodges and ranches to small, independent motels and deluxe, full service hotels. See Our Business Partners for more information. The minimum age to participate in our snowmobile tours/rentals is 6 years old. To drive a snowmobile, you must be at least 16 years old and have either a snowmobile safety certificate or a driver’s license. Snowmobile safety certificates can be acquired through Snowmobile-ed.com. At Swan Mountain Snowmobiling, our first priority is your safety. All of our guides are certified in CPR, Wilderness First Aid and Avalanche Awareness. We walk all of our guests, whether they are interested in guided snowmobiling or snowmobile rentals, through a very thorough equipment overview and safety orientation. No prior experience is required for our Montana snowmobile tours, however we do recommend some experience for snowmobile rentals.